How you can have a huge, meaningful impact on people without knowing them personally. How being confidently authentic, even when you’re too “extra” for some, can be incredibly impactful. Why the saying, “die before cry” when there’s a stressful work situation, isn’t the only option for women. Why it’s important to value pleasure in your life. How it’s important to want what you want and be authentic in business and beyond. How midlife transition can highlight your thinking about what you can’t do instead of thinking about what you can do if aren’t careful with your thoughts. Why being a mentor can be a super amazing way to give back and feel fulfilled. Mentorship in Midlife is a super important topic. 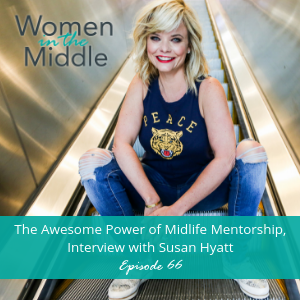 This week’s episode is the fourth interview in the Midlife Mentorship Series on the Women in the Middle Podcast and features an interview with Susan Hyatt. Susan is a Master Certified Life and Business Coach based in Evansville, Indiana. She specializes in helping women get more of whatever they want—whether it’s more money, more media recognition, more pleasure, more passion, or more time to pursue meaningful goals. 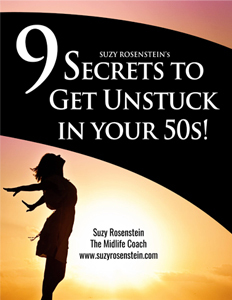 Susan is the author of two books, Create Your Own Luck and BARE. Her work has been featured in places like O: The Oprah Magazine, Woman’s World, Cosmopolitan,and The Huffington Post. he’s the creator of The BARE Process, a trademarked system for upgrading your mental and physical health, building more energy and confidence, and creating the life that you want. Join us as we explore the whole topic of why it’s so important to find a mentor in midlife and also how fulfilling it is to be a mentor in midlife. Suzy shares what she’s learned from Susan Hyatt, who also reflects on what she’s learned from mentors in her life.